I previously wrote how grateful I was to have discovered Inbal's wonderful Bruckner cycle in Frankfurt. 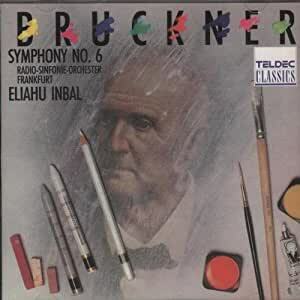 Nowhere else Inbal's excellence as a Bruckner conductor is more evident than in this splendid recording of Sixth. This is the most sublime, if not the most grandiose, symphony Bruckner composed. Just listen to a few measures from the Adagio (II.) and you know what I mean! This work must be taken seriously with a long breath at a leisurely tempo. I take any interpretation that rushes through challenged with my defiant opposition; for me Karajan and Dohnanyi fail in this regard. Take the Inbal and find out how he starts out the Majestoso (I.) at such a steady, measured tempo. At 17'51" nothing is glossed over, no note passes by unnoticed without catching your ears. Then comes the great Adagio with all the beauties, sublimity so effortlessly and naturally engulfed out. This is indeed a great recording of Bruckner's most neglected but in fact finest composition next to his Ninth. Teldec captures the orchestra (who plays out of their hearts for the conductor) in beautiful sonics. Not only the orchestra is wholly competent, it also sounds completely at home with the music of Bruckner. Inbal's tops the aforementioned Karajan, Dohnanyi, and a dozen others I already own and deserves my highest nod.